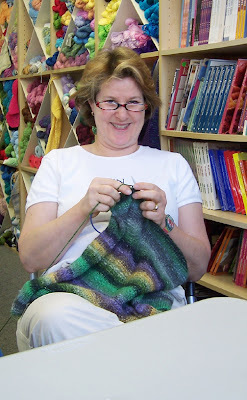 Susan is knitting away on her Noro sweater. It's her first one! Isn't that great?! 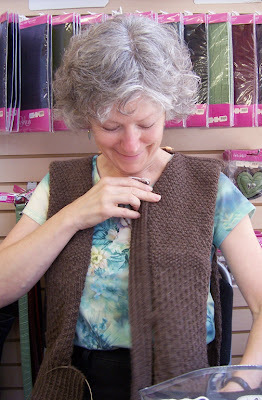 And here's Dana who is modelling pieces of her Mari sweater knit from Eco Wool. We were discussing today what a great all-around wool Eco Wool is. It comes in beautiful natural colors (plus some dyed ones now) and is a great value. I've knit a hoodie for my husband out of it (which he loves) and am in the middle of sweaters for #1 Son and Dr. Destructo. And I still love the stuff! I'm thinking I need a Rogue out of it next. 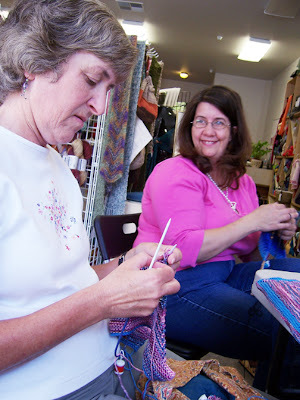 Dana and Therese were agreeing that the more you knit with it, the more you love it. I have even knit a sweater of it held together with a strand of kidsilk haze. Can you say "fiber therapy?" And here are Carol and Kathleen, who was new today. Welcome Kathleen! And Kathleen was working on a Calorimetry with this amazingly gorgeous wool/soy yarn (name escapes my tiny brain at the moment!). She also brought a pattern for a mini sock that she's asking people to knit for her new non-profit. You look like you had a lot of fun! Beautiful things! OMG! That Scarcelle looks too dainty! I'm guessing that she's doing it out of KidSilk or something like that? I don't think I can knit with something that fine. I love this post. It makes me feel like I was there! Oh, how you tantalize us with the hints about the stealth knitting project! so that is what therese looks like! 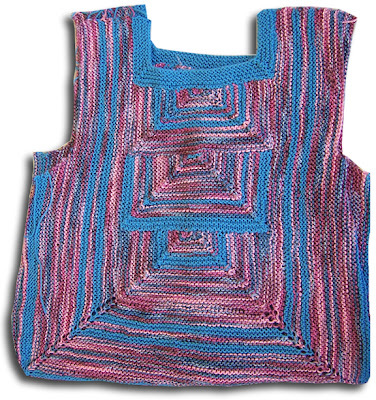 sorry to be knitpicky... but Sarcelle was designed by Kristi, Cookie's co-blogger. 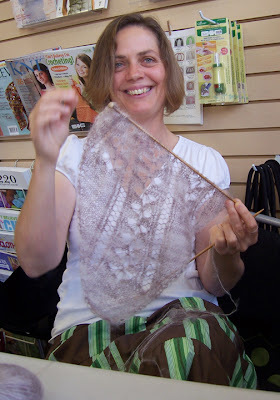 Knitting groups are so much fun, glad you had fun at yours. Looks like a fun time was had by all. And yes, I am placated by other people's knitting. Enjoy the movie and your secret knitting. These are great photos- it looks like a good time! This makes me wish I had a group. Nice post! What a great way to spend a Saturday. Knitting Groups give you such inspiration. Yeah, a little time with Colin Firth - why not? I've never had a group to knit with - I'm jealous -it looks like fun!! Oh, that looks like such fun! I love what everyone is knitting! Awww, what a fantastic time it seems you've had! And there's some really awesome knitting going on, such beautiful pieces of knitting art! Great - thanks for sharing! What a great time!! You are very lucky to have made good knitting friends! Lucky them too to have you around to show off to and to get advice from. You are an amazing talent! !